One of the main types of fossil used to understand the first flowering plants (angiosperms) are charred flowers. These charcoals were produced in ancient wildfires, and they provide some evidence for the types of plants that grew millions of years ago. However, when fires burn they not only produce charcoal, but they also destroy it. This has led scientists to consider whether some types of flowers in Earth's past were more likely to be destroyed during fires, rather than preserved as fossil charcoals in rocks. In their study published this week in Geology, Victoria Hudspith and Claire Belcher show that different types of plants caused fires to burn differently (some hotter and some cooler) and that the different shapes and forms of certain flowers made them more likely to be entirely burned away by fire and turned to ash, whereas other types were more likely to remain as charcoal. 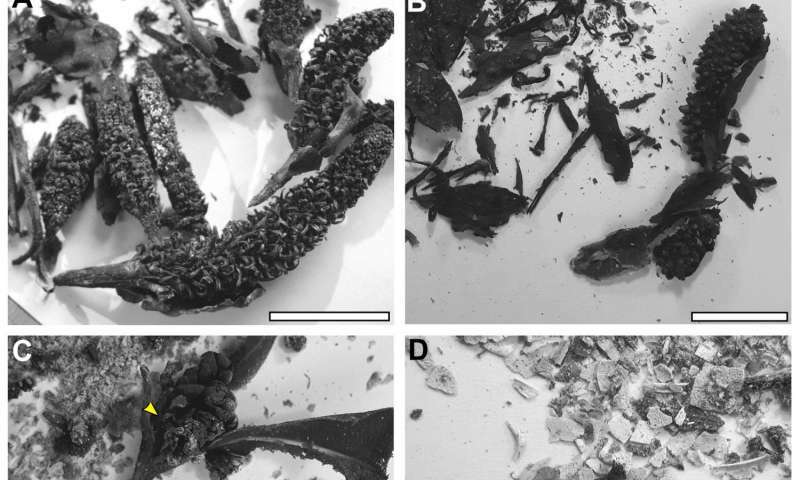 This is important because if scientists are trying to use charred flowers to understand the diversity of the earliest angiosperms then they also need to consider that some flowers may have been turned to ash in these ancient fires and not preserved as charcoal at all. In other words, paleontologists must now consider that the charcoal fossil record of flowers is unlikely to preserve all types of flower equally, and as a result, they may be missing information about the early evolutionary history of angiosperms.